With my roots firmly set in newspaper photography, it’s always a pleasure to get a commission to shoot pictures for a client that require that newspaper style. It’s not the same as shooting for a corporate website or brochure which generally requires a bit less story telling and tends to be more polished. For a newspaper style you can work faster and produce a wider range of image options. It’s ok to pull in props from what’s around you if it helps, and you’re not looking for a totally slick look, which can leave a photo looking less genuine when it’s for a news context. A good recent example is a job I shot for Positive Outcomes, a national training company, who offer a range of training and apprenticeship services to companies and organisations and training to help a whole range of people looking to improve their work skills. 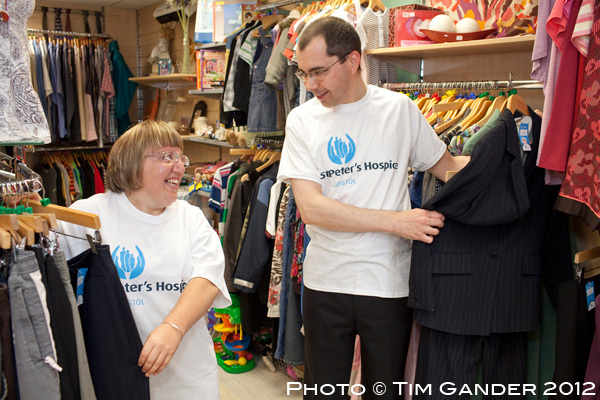 In this example two people, Holly Drew and Alistair Johnstone, completed their on-the-job training while volunteering at the St Peter’s Hospice charity shop in Westbury on Trym, Bristol and I was asked to produce a set of images suitable for local press and web use to help tell their story. After about an hour on site I had a good selection of images, both upright and landscape orientations to suit picture desk requirements. I thought perhaps you’d like to see a selection of the results. Here’s a sneaky look at the challenges sometimes facing a photographer in what might otherwise be a fairly standard assignment. Last week was Biology Week, but you knew that already. You’ll also know the purpose of Biology Week was to raise awareness of the role of biology in the 21st Century with debates and events catering to all ages. 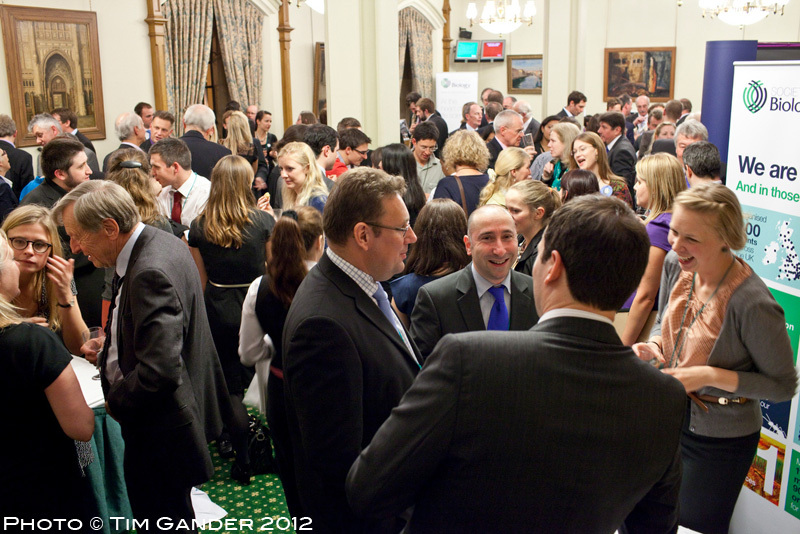 I was commissioned by the Society of Biology and Biotechnology and Biological Sciences Research Council to cover an event at the House of Commons designed to celebrate the week and spread the word of the importance of biological study to understanding our environment and the opportunities for innovation from new discoveries. 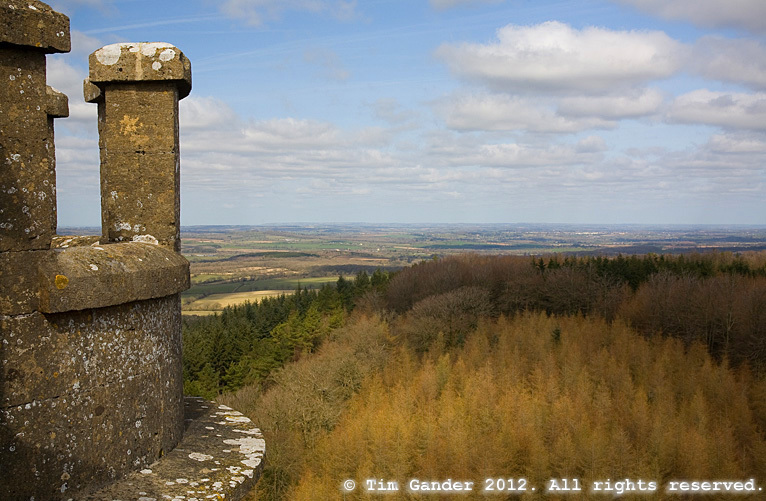 My pictures would be used for press release material and the Society of Biology website news page (see link above). 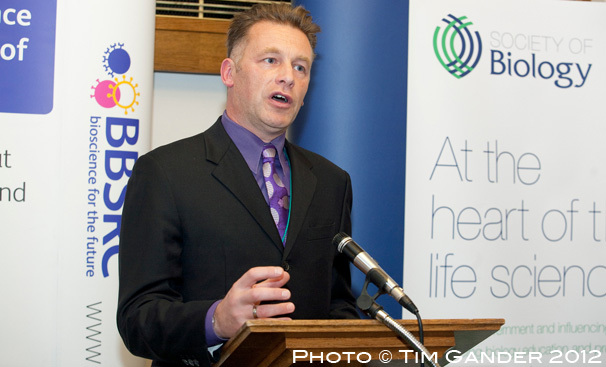 The event was held in the Churchill Room where the great and the good of the biological sciences community mingled with MPs, peers and Chris Packham (BBCs Springwatch and Autumnwatch presenter). My task was to cover the speakers giving their addresses, people networking and enjoying the evening and anything else that presented itself. It wasn’t an easy task as the room was packed to bursting, which made moving around quite tricky and often made it difficult to get clear shots of specific people. The lighting was pretty poor too. Very warm colour tone, which when added to people’s hot faces made orange something of a theme for the evening. My best bet was to use a mixture of flash and slow shutter speed to try to have people properly lit without it looking like I’d blatted them with flash, then cool down the warm cast in post-processing to get skin tones looking more human. Despite the tricky shooting conditions and the extra post-processing involved, as it was my first shoot inside the Parliament building I was thrilled to be there. I highly recommend a tour if you’re ever in London because it really is a fascinating building. It strikes me that the phrase “work-life balance” was a lot more fashionable just a few years ago. Maybe it’s just my perception that it’s not used so much now, but I also wonder if it was more popular pre-recession, when it was thought the economic wonder would never end and people could carve themselves a bit more leisure time, be more flexible about the work hours they kept and spend more time with family, simultaneously expecting income to remain on an upward curve. Then The Crash came and everything changed. You work longer to earn less. You work longer to keep your job and seem more indispensable than your colleagues and hope to avoid the chop when jobs are cut. Competition for jobs becomes fiercer and this is much the same for the self-employed. Being a freelance photographer tends to mean my hours are set by my clients. Of course to a certain extent my hours are dictated by the effort I put into promoting myself which has an impact on how many clients I have. After that, it comes down to when my clients need me. It’s sometimes quite difficult to explain to people, especially those in salaried positions, the reality of being a freelance, that although I’m self-employed I have very little direct control of my diary. If I have no bookings I can do what I like; promote myself, go networking, meet new or existing contacts for coffee or go for a long bike ride. But this isn’t an ideal scenario. Networking and bike rides can be done flexibly, but aren’t paid activities. Naturally I hope having coffee with a contact will lead to paid activity, but networking is a long slog and not guaranteed to result in work. Cycling almost never ends in paid activity. Anyone who works as a freelance, and I think especially photographers and writers, will understand that as far as work-life balance goes, you work when work is offered. And when work isn’t on offer, you work on finding it. Both involve work, neither activity involves the “life” part of work-life balance. This is no sob-story though. I thoroughly enjoy my work, even if it can seem precarious at times. I chose early on in my career not to sell myself cheap, so my diary rarely bulges with commissions from clients wanting bargain prices over quality. I work with clients who appreciate what I do and are willing to pay fair rates for my work. This means I can earn a living without grinding myself into the dust. It may not give me a luxurious lifestyle, or money for many fripperies and “things” but it does give me occasional leisure time at times when in a salaried position I’d be stuck in an office. I think I’d call that work-life balance. It has to be. It’s all I have. Those of you who pay attention will recall I recently wrote about my first foray into Instagram. I said it was more about the filters and effects than the content of the photos and I now think I was wrong. It’s true many people shoot and edit their images in Instagram, but the beauty of Instagram is that it is primarily a way of sharing images. The pictures themselves don’t have to be shot in Instagram, or even on an iPhone to be shared this way. I’ve uploaded images from my professional portfolio as well as more fun pictures from my personal life. A more recent fascination for me has been the introduction of the Panorama mode with the new iPhone operating system. 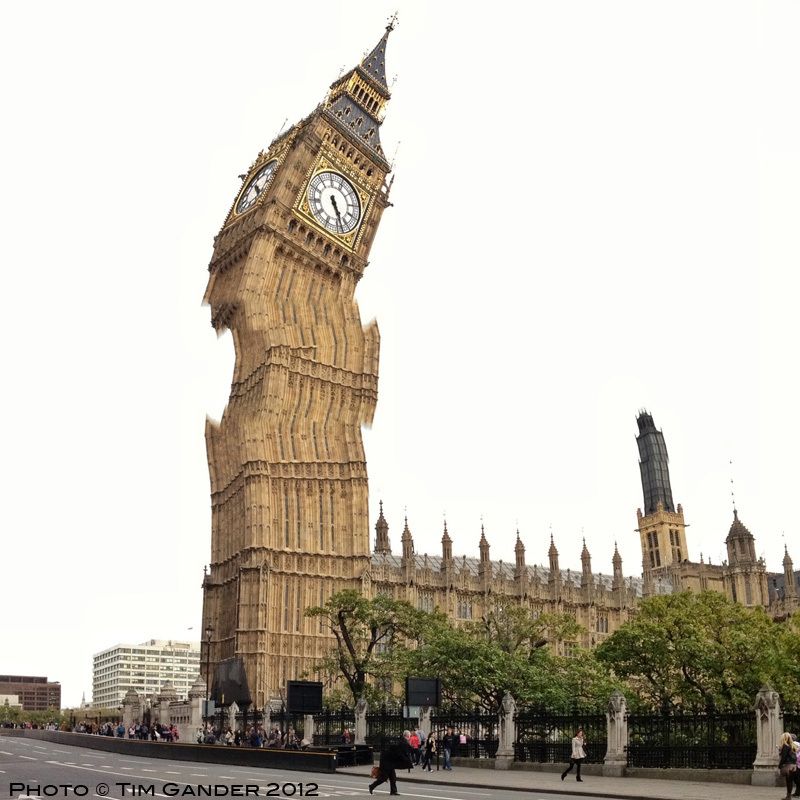 Not only can I now shoot panoramas using this function, I’ve also been experimenting with it to see what weird effects can be achieved by panning in a way the phone and software don’t expect and seeing how they deal with it. 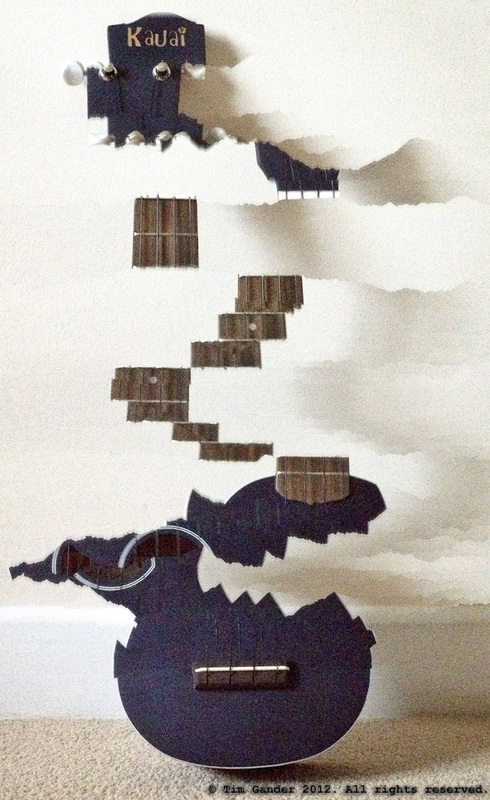 As an example, see my “torn” ukulele photo below my more standard panorama. A fairly standard panorama, though I’m impressed with the iPhone’s quality here. Other Instagrammers build up massive followings and the most successful of them do it by shooting in a very consistent style – whether on their iPhone or by uploading images from their SLR cameras isn’t always clear, but consistency seems to be the key issue. I personally prefer to share a mixture of portfolio, experimental and personal-moment (drunk in the pub) snaps. I might take a photo of some recently published work and share it on Instagram so people get a better idea of the kind of work I do. I simultaneously share my Instagram posts on Twitter and sometimes Facebook too, which means I can reach an even wider audience. If you’re on Instagram look me up @takeagander and let me see what you do. One account I’ve been especially impressed with recently is @tonytanktop who creates larger images from tiles of individual ones. A brilliant way of using the technology and the sharing platform in an unexpected way. I suggest you look him up too and prepare to be dazzled. I think it’s fair to say, I’m starting to understand Instagram a lot better. It’s becoming a business tool as well as a way to have fun. My initial cynicism (and I’m a natural cynic about these things) has given way to greater curiosity to explore more boundaries.